Cathy Dobson has been living in Germany for over 15 years. Five years ago she and a German business partner set up a highly succesful consulting business from the former pigsty of the old farmhouse where she lives with her husband, three children and an ever fluctuating number of cats. Over the past 15 years Cathy has advised many of the leading media and telecommunications companies in Germany. 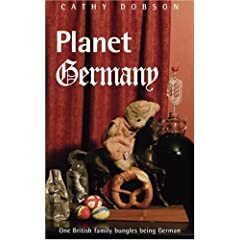 Cathy Dobson is the author of Planet Germany, a crazy tale of an ex pat’s adventures settling into the Rhineland in Germany. I would like to email you a specific question about curry of all things but not sure if you want the whole complicated question in your comments section. Do you have an email address that I can use to contact you? I emailed you the recipe you’re looking for – I think it’ll give the result you’re looking for! So cute! Are you looking for homes for them eventually? Anywhere in the Cologne area? Yes… at least for some of them. They’re all male. I’ve added you to the feed aggregator on my blog. You may get some click from it. I saw your query on Toytown and also read the review on Planet Germany in the WT. I’m definitely going to get a copy: Do you know where I can get the best price? I like your website very much. I’ve tried to do something a little similar myself, aimed at English learners and fellow teachers. I’d be interested to know who did your website. I need to call in a good webcrafter, someone who can take on the tech side of mine as that’s really letting it down at the moment. If you could drop me a line with a suggestion, maybe also let me know what you think of some of the content on Know Howe, I’d be very grateful. I promise you feedback on your book in returm! If you live in Germany, Planet Germany is available either on Amazon (via various resellers – but pick a UK based one if you don’t want to be hit for high postage) and even better, Buch7. Right now Buch7 has the cheapest price AND as they give 50% of their profit to good causes, you can feel smug while you shop! Can’t say fairer than that! This site is by http://www.Wordpress.com – you just register and then set up your own blog. You can change the mastheads and colours, choose your layout from a wide selection of templates…the layout I’m using is the one called “Press Row” designed by Chris Pearson. It’s all free at WordPress. Great blog, I added you on my blogroll on http://www.d-usa.info. I am a German living in the USA, and I always love to read what expats living in Germany think about my old home. just to let you know that I have written a review of your great book on my little blog. just to let you know I have reviewed your book on my little blog. p.s. sorry if I’ve sent this to you twice; my cat decided to cuddle up to me whilst I’m trying to type! I lived in Germany for 20 years…….I miss it still! Great to read your blog, but it makes me homesick! I lived and worked in and around Heidelberg, where are you? And my Planet Germany book still somewhere out there since many people queuing to borrow it, doh! I visited Munich for Oktoberfest in 2000 and LOVED it! Found you on Condron. Nice to meet you! Hey there… just wanted to give you props, like everyone else seems to have! You’re on my favorites, and its a good read all the time… Nice to see things i can possibly relate to, as I’m moving to Köln in August! I’m really enjoying your posts about life in Germany – the fast food video is priceless! I also wanted to contact you about a survey Marks & Spencer are running exclusively for British expats – is there an email I could send the details to? I found your blog and lots of information about your book during my online research on expatriates in Germany. Since you seem to be a bit of an expert on the expat experience here in Germany, I’d very much like to introduce Internations.org — a Munich-based global network for people living and working abroad — to you. Maybe you could recommend it as a resource to your readers. InterNations.org is the global networking site with over 230 local communities and more than 120,000 members. We’d especially like to point out our live events in ca. 100 cities worldwide, including major German cities such as Berlin, Hamburg and Munich, meant to bring expats from all nations and locals together and help expatriates and their families to settle in. For this reason, we believe that your readers might benefit from knowing about us. We’d like to kindly ask you to place a link to our homepage on your blog. Of course, you are cordially invited to register with us and have a look at our network. The registration process is free of charge and will only take a few minutes. You can get in touch with me via e-mail (m[dot]grobbel[at]internations[dot]org). I’m really looking forward to hearing from you. I couldn’t find any contact information so I decided to leave a comment here. You are welcome to display one of the image badges we have created specifically for blogs we feature in Germany. This is an easy way to let your readers know that you have been recognized as an outstanding blogger. You may contact us to receive a badge via email. Thank you for all the high quality content you have contributed to the global online community. We look forward to continuing to follow your experiences abroad in Germany. If you have questions about GO! Overseas please don’t hesitate to contact us. I’m the editor of Expat Arrivals.com (http://www.expatarrivals.com), a site devoted to developing comprehensive destination guides aimed at easing expat transitions abroad. I came across your blog while doing research for the German portion of our guide and was hoping I could convince you to contribute. We exchange valuable content about destinations for promotional profiles where you can levy exposure for yourself and your blog. Furthermore, would you be willing to link to our site from your blog. I think some of our info could supplement your posts nicely. I look forward to hearing from you! just wanted to share a link for you and your readers: http://www.linkexpats.com is a social networking website for expatriates. They can create ads, events, forums, and see news about their home country. You might want to add it to your list of links for your readers. here’s a native Teuton talking. I enjoyed reading “Planet Germany”, it gave me lots of chuckles and laughs. Have you ever considered to let it be translated into German? Now, the reason why I’m commenting is not only to express appreciation but also because I am interested in that recipe of the chicken and prawn curries that you served for your birthday party. I hardly can imagine that no German liked it, it sounded yummy to me. It also seems I’m not the first to ask. I love your blog! It’s now added to my favourites. I wondered if you’d be interested in reading mine? I write about representations of Brits and Germans in post-war popular culture and how this reveals what they thought about each other. I’m sure this was what you expected when you wrote your entertaining and informative piece!